Why Do Americans Suffer From Expensive Internet? Americans never seem to be happy with their internet service. “It’s too slow, too unreliable, and too expensive,” we say. But are these complaints justified? Research shows that yes, compared to the rest of the world Americans are overcharged for their internet. The below graphs, from PBS and the Open Technology Institute, compare internet prices and speeds around the world and show that Americans pay the most for their internet service and get only average speeds in return. The warmer colors represent faster speeds and the bigger circles are higher prices. 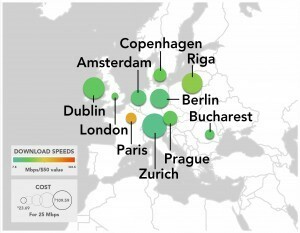 For example, the typical New Yorker pays $55 for an Internet connection of 25 megabits per second which is nearly double that of what consumers in London and Seoul pay. 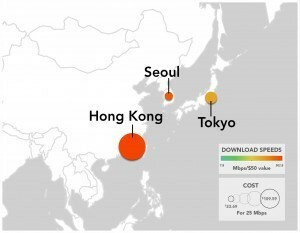 Additionally, residents of Seoul, Hong Kong, Tokyo, and Paris get connections that are nearly eight times faster. So why is internet so expensive in America? The major reason is a lack of competition among Internet Service Providers. It’s simple economics: there’s high demand for internet and only a few providers in the market, limiting the supply. The result is higher prices for consumers. According to data from the FCC, half of American homes have only two options for an Internet Service Provider for basic broadband. If they want faster speeds their choice goes down to only one. 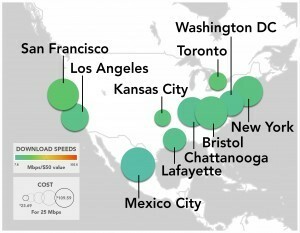 The blue areas in the following graph, from Business Insider and the FCC, are the cities in which customers have two or more choices between broadband ISPs. With little competition, ISPs lack the push they need to lower prices and improve services. They operate as quasi-monopolies, controlling the service offered, the areas built to, and the price charged. Citizens in France, in comparison, have an average of seven ISPs to choose from. Why is there so little competition in the United States? It’s because high initial costs and powerful incumbent providers make it incredibly difficult for new Internet Service Providers to enter the market. Becoming an ISP takes a massive initial investment. ISPs need to be able to pay tens to hundreds of thousands to millions of dollars in up-front costs for the equipment they need to function and for permits and construction to lay new fibers. Getting this much money can be a huge barrier. Because the initial cost is so high, it’s difficult to find investors who are willing to wait five to ten years to see a return on their investment in the company. Additionally, fiber networks are not valuable collateral to a bank, so it can be difficult to get a loan. The incumbent ISPs are extremely powerful and have already captured most of the market. ISPs already in place have likely faced little competition for a long time, meaning they have a firm grasp on the market. It can be difficult, but essential, for new ISPs to capture market share. If they can’t do this, they may never recover their initial investment. Additionally, a common tactic for big ISPs who feel threatened by start-up providers is to utilize their massive budgets to take legal action against the newcomers with the goal of burying them in legal fees. Internet Service Providers who partner with FiSci are able to jump the hurdle of massive start-up costs. Instead of requiring a huge initial investment, FiSci, with a revolutionary LTEaaS program, allows ISPs to pay a monthly subscription fee for the equipment they need to operate. This means that the new ISP is able to almost immediately begin generating profits. They are they able to use these profits to pay for the equipment they use, greatly reducing the barrier of initial costs and the need of finding investors that are willing to wait years to see a return. Instead of paying a huge up-front cost for equipment, FiSci enables providers to build a network, use it to generate profits, and then use these profits to pay for their equipment subscription. Additionally, FiSci sells LTE solutions for internet access. This means that subscribers don’t have to come up with the cash required to build their own fiber network. It also gives them an edge over the competition, as LTE can offer faster, more reliable, and wider spread service than even fiber networks. Finally, the LTEaaS program is not just equipment. It includes network buildout assistance and expertise, further reducing the cost and challenge of building a new network. To learn more about the benefits of LTEaaS click here. Eliminating barriers to entry will enable new ISPs to join the market, driving price reduction and service improvement for internet service nationwide. Are you frustrated with your current Internet Service Provider? Do you want to know more about how we can help you provide better service in your community? Send us a message or leave a comment below!